Tecno corporation creates amazing quality digital gadgets at an initially low price for the low ends. Developers and engineers work closely with each other and create perfectly secure, powerful and extremely easy to manage mobile phones. A striking example of such a modern, universal gadget is Tecno M5. Managed OS Android 4.2.2 Jelly Bean gadget is simple and easy to use, and helps to create a beautiful, vibrant pictures. Tecno M5 combines perfect functionality and affordable price. Check it on Jiji - you will be charmed by the offers! 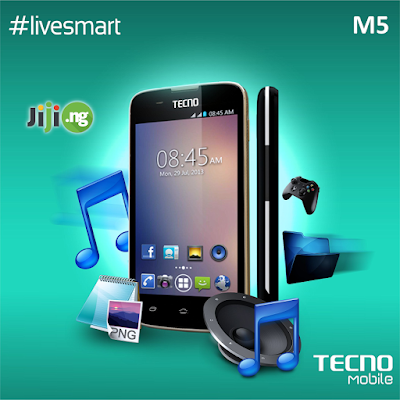 Find Tecno M5 in your region with Jiji - smart shopping for smart people! The external smartphone Tecno M5 is a classic universal gadget that always look very imposing. A plastic cover protects it from moisture and dust and makes the phone more comfortable to carry in hand. Good, durable display under reliable protective coating is hiding compact 4-inch touchscreen. Tecno M5 differs by highest quality sensor, the wide range of colors, consisting of 256,000 colors and shades. The generated image has a high contrast and clarity. Matrix has the highest speed of response to user actions, making usage of the smartphone extremely convenient. High-quality camera of Tecno M5 provides its owner with ample opportunities to create high-quality, vivid, memorable photos. The main camera of 8 MP is specially designed to create both amateur and professional images. The camera is equipped with a powerful LED-flash and supports auto-focus technology. The camera can be easily operated using the set of gestures. The front 1,3-megapixel selfie camera automatically improves the quality selfie made using special software. The remarkable performance and high compatibility under ergonomic, durable body gives a powerful e-filling. The high-performance smartphone provides a powerful dual-core CPU. Combined with 1GB of RAM, the processor easily maintains a stable, smooth operation of even the most demanding applications. To install the software and storage of personal content in the phone has 4 GB of internal memory. But if this amount may seem small, you can easily connect a microSD card up to 32 GB. Smartphone Tecno M5 is equipped with a durable battery. Installed modules Bluetooth 4.0 and Wi-Fi will help to convey to another compatible device any amount of data with maximum speed and with ultimate comfort.